HMH Books for Young Readers, 9780547051994, 64pp. Illustrated in full color throughout with stunning compuer-generated artwork and with rare paleo photography, this story of scientific sleuthing invites us to wonder what our ancestors were like. 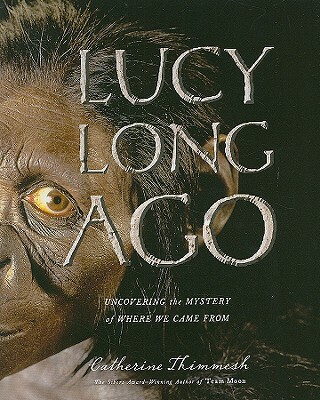 From the discovery of Lucy's bones in Hadar, Ethiopia, to the process of recovering and interpreting them (a multidisciplinary approach with contributions from paleontologists, paleoanthropologists, archeologists, geologists and geochronologists), this book shows how a pile of 47 bones led scientists to discover a new -- and, at 3.2 million years old, a very very old -- species of hominid, ancestral to humans. Scientists involved include: James Aronson, geochronologist at Dartmouth, NH John Gurche, paleoartist at Cornell, NY Donald Johansen, scientist at Institue of Human Origins at Arizona State University Owen Lovejoy, biological anthropologist at Kent State, Ohio Dirk Van Tuerenhout at Houston's Museum of Natural Science, Texas.